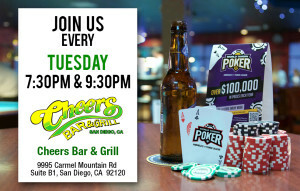 World Tavern Poker (https://www.worldtavernpoker.com/) is coming to San Diego, California! Come and join your Bartender Nick Gordon and Tournament Director Myles Esmele EVERY TUESDAY NIGHT at 7PM & 9PM. There will be 2 rounds of Texas Hold-Em Poker with prizes, cash from World Tavern and a chance to win a seat at the National Poker Championships!